Athletes often debate the importance of pre-workout nutrition. Some believe it isn’t necessary while there are others who consider it an integral part of their workout. We belong in the latter half who believe pre-workout nutrition is important, and the right one can do wonders. Taking the right pre-workout supplement will help you boost your performance and provide lasting energy. Not only that, but it can also help you lose weight, build muscles or just get stronger. Your pre-workout nutrition is important as it can make or break your workout and help you get the most out of your workouts. Whether you are a cyclist, runner or just into any other sports, a pre-workout supplement is essential. While all the ingredients are naturally available through food, many times your body does not get enough of it or may need more. By consuming the right pre-workout supplements, you are guaranteed to perform better. One of the latest to enter the Indian market is Fast and Up’s effervescent pre-workout tablet. As the people’s interest in sports is increasing gradually, Fast and Up have been educating and providing innovative sports nutrition for cyclists, triathletes, fitness fanatics and more. One of their major objectives is to help budding Indian athletes in the field of nutrition. 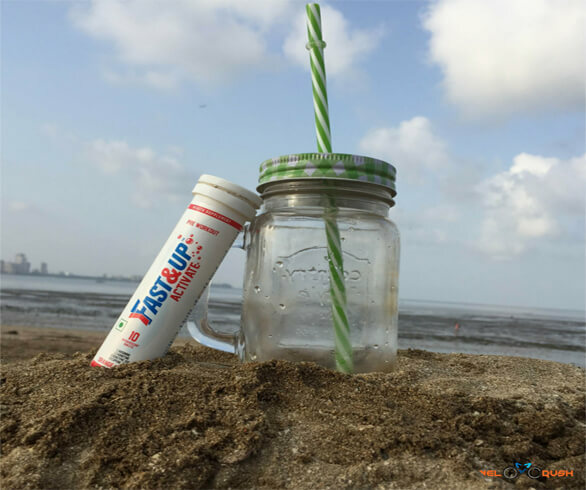 Read on to know about the ‘Fast and Up activate review (pre-workout)’ below. But before we get into the details, do take a look at the teaser that will give you a better idea of the product- Click here to see the 34-second video and don’t forget to subscribe. The product comes in the form of effervescent tablets and contains some unique ingredients like L-Arginine, L-Carnitine, Coenzyme Q10, Lycopene and Zinc. You might want to read the Fast and Up Reload review! During the fast and up activate review, we learned that the drink counters the damage caused by exercise, induced by oxidative stress which in turn delays fatigue and increases endurance. L-Arginine has the distinct ability to increase blood flow by enhancing vasodilation and improve oxygen availability to muscle cells, equipping you for superior performance! L-Carnitine helps burn fat for fuel which is a highly critical factor while exercising or racing! L-Arginine is well-known among people who work out because of its ability to enhance strength and endurance and reduce fatigue during training. It also has the ability to increase nitric oxide production and blood flow to the muscles. L-Carnitine is a nutrient that helps the body break down fat and turn it into energy. It also increases the activity of certain nerve cells in the central nervous system. Coenzyme Q10 (CoQ10) is a naturally-occurring compound found in every cell of the body. It is used to produce energy for cell growth, maintenance and functions as an antioxidant. Lycopene is a powerful antioxidant that may help protect cells from getting damaged. On the other hand, zinc helps increase athletic performance and improves training as well. The tablets dissolve as soon as they are put in water and are ready for consumption. The tablets are made at a pH just right for absorption; leading to the faster onset of action. As the solution comes in a tablet form in a tubular packing, they can be easily carried around. The Fast and up activate tablets dissolve completely and when consumed results in less irritation and greater tolerability. As compared to the other products in the market, Fast and up activate [pre workout] tablets taste way better. Also, these effervescent products retain their flavour even after lengthy storage. The fast and up activate [pre-workout] is ideal for cyclists, runners, marathoners, swimmers, fitness fanatics and many others because of the right mix of ingredients. Users kindly note that: None of the tablets is a substitute for food; hence, consuming your pre-workout meal is a must. Have you tried any of the fast and up products? Do comment below on the fast and up activate review and let us know your thoughts on the same.